The Swedish foreign ministry said it would summon Russia's ambassador on Tuesday over Moscow's claim that Sweden could be the source of a nerve toxin used in the Skripal attack in Britain. Britain accuses Russia of being behind the attack in Salisbury on Sergei Skripal, a former Russian spy for the West, and his daughter Yulia, using the Soviet-era nerve agent Novichok. Moscow has poured scorn on the allegations and a Russian foreign ministry spokeswoman said on Saturday the most likely source of the agent was Britain itself, the Czech Republic, Slovakia, the United States or Sweden. 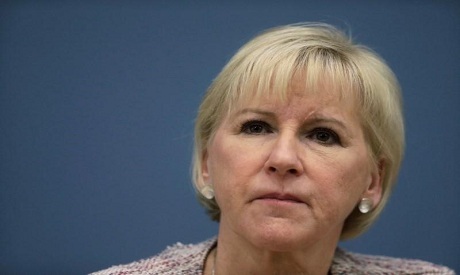 Swedish Foreign Minister Margot Wallstrom has called that claim "unacceptable and unfounded".